Now that the final, final results of the US midterm elections are pretty much all in, let’s take a look and see whether history will pan out and continue to reward the bulls. Before we do that, however, let’s remember what last month’s report highlighted: the data show that 100% of the time US stocks rise in the 12-month period after the US midterm elections. 100% of the time! That’s quite an impressive record. Yet, every seasoned investor knows records are meant to be broken. Accordingly, the question becomes will this be the time when the streak stops? And, what tools can an investor use to help determine if history will repeat itself or will the most dangerous four words in the economic and financial language – The Time is Different – ring true? As our prior monthly reports have shown, the answer is hard to find in what is known as the “real economy”1. And even when one can identify useful indicators, such as the leading economic indicators or the Nowcast reports of the New York and Atlanta federal reserve banks or whether assets are over or undervalued (such as Robert Shiller’s CAPE index), the timing of such tools tend to be more coincidental than predictive. For answers as to the trend and sustainability of a stock market trend many an astute investor turns to financial market tools to help predict the future of a trend in place. We fall into that category for as helpful and important real economy tools might be, we have found that going to the horse’s mouth, so to speak, is an important, even vital, part of the investment decision-making process. Which brings us to the so-called “death cross” (and its counterpart, the “golden cross”). Of all the financial market intelligence tools available, we have found that price and its momentum are the most reliable Financial Market Intelligence (FMI) tools around. As the following chart illustrates, price and its momentum – reflected in the form of price’s moving averages – provide the highest predictive value of the future price action of a given financial asset, which in this case is stocks. Back-tested over 23 years, the combination of price and its momentum is shown to have a 70% predictive value of future price action. Allow us to describe. The Mega Trend is what we call enhanced version of the golden (bullish) and death (bearish) crosses. It’s the price action of a financial asset in relation to its momentum, which is its moving averages (50 and 200 day). Here is a current picture of what the S&P 500 looks like in terms of its price action and its momentum. As the chart to your left illustrates, price is right around its moving averages after having been above its moving averages for the better part of the past several years. At the same time, the shorter-term moving average (50-day) was above its longer-term brethren (200-day) but is also now right at that point. And the slope of both averages has been upwardly tilted – until recently, that is. Which brings us to the 3 pieces of what we call the Mega Trend. Until very recently, however, price was above its moving averages, the shorter-term moving average was above its longer-term cousin, and the slope of both averages was positive (upwardly sloped). During this time stocks went in only one direction – Up! During this time, also, a few slumps in price were seen (red arrows) where price dipped below its 200-day moving average. And far too many times did price drop below its 50-day moving average. 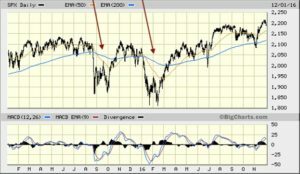 BUT at no time did the three conditions noted above – price below its moving averages, the shorter-term moving average below the longer-term moving and both moving averages downwardly slopped – occur in which a trend reversal call could be made. Therefore, the only FMI conclusion that can be made is bullish with signs of weakness. But signs of weakness are not enough. Only an outright, clear-cut call must be evident. Close works when playing horseshoes and tossing hand grenades. If the Mega Trend has a 70% predictive value, that means it wrong 30% of the time. What happens when it is wrong? When it generates a false signal? The next chart to your left shows the two most recent false signals of the Mega Trend – one in the fall of 2015, the other shortly thereafter in winter of early 2016. As was the case in every prior such periods over the past 23 years, when the Mega Trend produced a false signal the prior trend (which in this case was bullish) was reestablished within 3 months. In other words, when a false signal is generated it negates that signal in a very short period of time thereby eliminating any serious loss of performance. Doesn’t get much better than that. The combination of real economy analyses and FMI tools like the Mega Trend increase the odds of getting the call about future financial market action right. Of course, nothing is foolproof. And nothing is forever – not even the stock market history of post US midterm election. All good things come to an end. The real economy data say the US economy is in fairly good shape while the global economy has begun to show signs of weakness. The real economy data also says equities pretty much everywhere are not cheap. 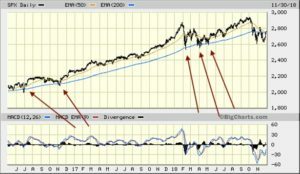 The financial economy data in the form of the Mega Trend reflects both factors: the bull trend is intact BUT weakness – as in a potential trend reversal – is evident. In sum: We are close to an FMI signal that what was is no more. However, as noted above, close works when playing horseshoes and tossing hand grenades. Not so much when it comes to the stock market. 1 The “real economy” is the place where we work and live – our jobs, our families, the things we buy and sell, the services we render and receive, etc.. You know – Life. On the other hand, there’s the “financial economy” a place where financial assets reside – stocks, bonds, monetary policy, etc. 2 A recent Bloomberg radio segment featuring our Chief Investment Officer, Vincent Catalano, covered some of what is in this report. To listen to that segment, click here. 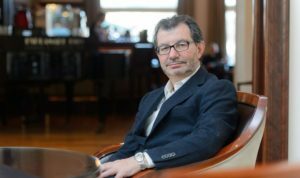 Our Chief Investment Officer Vincent Catalano, CFA was asked to voice opinion by The Wall Street Journal. Our Chief Investment Officer, Vincent Catalano, CFA, discussing PE role in portfolios that contain publicly-traded companies on Bloomberg Markets with Carol Massar and Jason Kelly.